The EFPRA 2018 Congress will take place at the Hotel Fairmont Rey Juan Carlos I. Set in 25,000 square meters of breathtaking 19th century gardens and revealing an unparalleled view of the stunning Barcelona skyline; this luxurious urban hotel provides guest with a tranquil retreat in the heart of Barcelona. 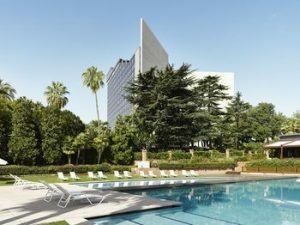 With a central location on the prestigious Avinguda Diagonal and surrounded by major attractions such as the famous Camp Nou stadium and the Barcelona Polo Club, Fairmont Rey Juan Carlos I will ensure the most memorable stay with engaging service and glamorous character. The Hotel Fairmont Rey Juan Carlos I is the main conference hotel, which is why the scientific program is being held in this Hotel only. We are pleased to announce the refurbishment of the Fairmont Rey Juan Carlos I..
From Mediterranean gastronomy to innovative cocktails, we offer a full gourmet experience that suit every mood and taste. Guests receive complimentary access to The Royal Club Fitness & Spa. Named by Condé Nast Traveler one of the top 10 fitness centres in the world, the club is also home to Check Vitae. Whether it is for pleasure of business, live the unforgettable Fairmont Rey Juan Carlos I experience and create long lasting memories.